Residents from neighborhoods across the city believe future leaders of Chicago should make it a priority to build out a network of safe biking and walking infrastructure and increase access to fast, frequent public transit service. This is some of what we learned after hosting two Active Transportation Justice Dialogue events at St. John Berchman Chuch in Logan Square and the Chicago Urban League office in Bronzeville. The purpose of the meetings was to collect input on the Active Transportation Alliance’s 2019 city election platform. Chicago voters will elect the next mayor and city council in February 2019, with the possibility of runoff elections in April. The Active Transportation Platform will reflect the input gathered from dozens of one-on-one meetings with civic and community-based organizations held throughout 2018 and the two Justice Dialogues this summer. Event attendees came from 13 different wards and shared ideas through the highly participatory World Café method for structured conversations. At each event participants reviewed a preliminary list of platform ideas and added their own policy proposals. For example, a call for an equity and environmental transportation working group of city agencies and community leaders received strong support. A proposal for the mayor and Chicago City council to commit to spending a fair share of city transportation dollars on a new, dedicated Bike Walk Fund of $20 million annually had near universal support. Active Trans is calling for the fund to give priority to projects in neighborhoods where the most crashes occur, which, in Chicago, are low-income communities and communities of color on the South and West Sides. Popular projects included better-lit crosswalks and countdown timers, curb protected bike lanes, and bus stop bumpouts. A dedicated Bike Walk fund would change the current practice of reliance upon a patchwork of local, state and federal sources, including aldermanic menu money. At both events, the themes of a greater focus on equity and more funding for significant operations and capital needs were raised as priorities. At the South Side dialogue, there was ample discussion about increasing the frequency of the Metra Electric route and developing policies to make transfers to CTA less costly. 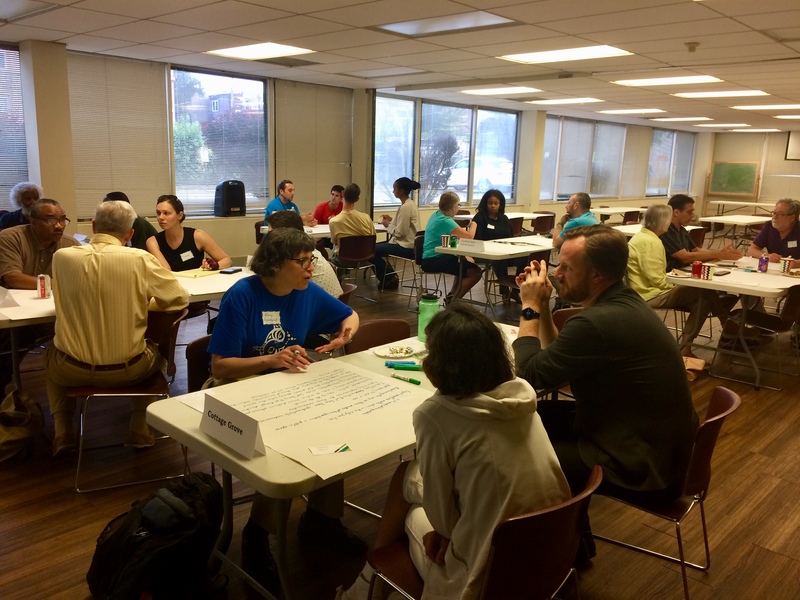 By contrast, participants at the Logan Square dialogue emphasized concerns about affordable housing and its connection to transportation. Couldn’t make a meeting? Share your ideas for the platform by completing our five-question online survey.